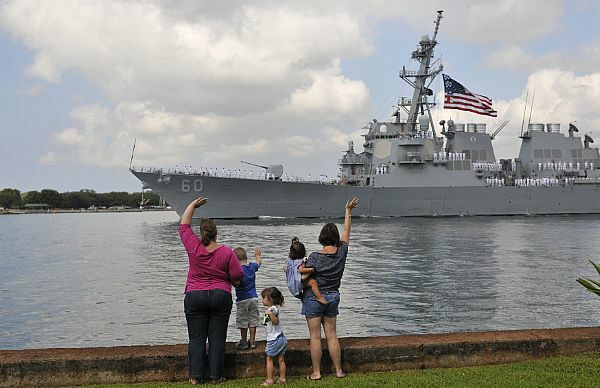 The USS Olympia recently returned from a 7 month deployment. What I like most about this photo is the creative red carpet and arch! Have you done anything creative like this for homecoming? PEARL HARBOR, Hawaii (NNS) — Friends and families of the crew from USS Olympia (SSN 717) gathered at the submarine piers to welcome back the Los Angeles-class submarine as she returned to Joint Base Pearl Harbor-Hickam after completing a seven-month deployment to the Western Pacific region, March 4. 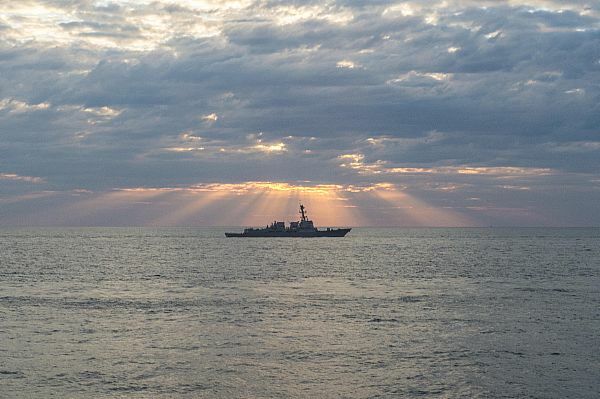 “Olympia accomplished national tasking, theatre tasking, and security cooperation events throughout the 7th Fleet area, and enhanced continued relations with our allies overseas,” said Cmdr. Michael J. Boone, Olympia’s commanding officer. Boone said the submarine crew worked around the clock applying months of preparations and workups into mission accomplishment. The range of the missions offered a broad aspect for training and development, creating experienced Sailors across all mission areas. “The hard work and determination from the crew of Olympia these past seven months developed a camaraderie that is second to none. We are returning to Pearl Harbor as a more experienced and capable unit,” said Boone. During the deployment, two officers and 21 enlisted Sailors earned their designation as qualified in submarines and now wear their dolphin warfare insignia. Boone added the crew was able to get time off to experience the diverse cultures in Yokosuka, Japan; Subic Bay, Philippines; Guam, and Singapore. While in a few of these foreign ports, foreign dignitaries and ambassadors toured the submarine. 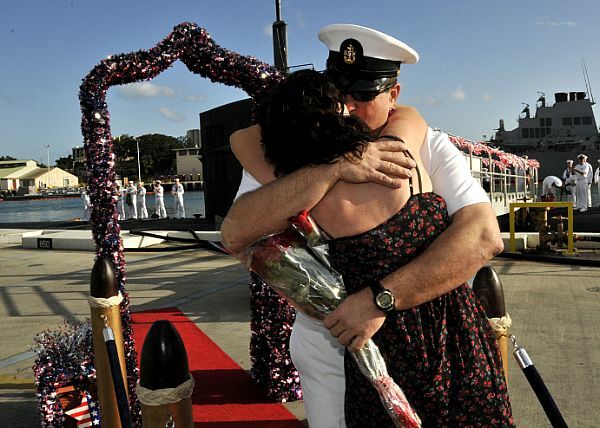 When the deployment was finally complete, the crew came home to a waiting crowd of smiling family and friends at the pier. “I am estatic, it’s been such a long time! The best thing is just to hold my husband and have him home.” said Beecee Hall, an Olympia spouse. USS Olympia is the second ship named after Olympia, Wash. Commissioned Nov. 17, 1984, Olympia is the 29th ship of the Los Angeles-class nuclear attack submarines. The submarine is 362-feet long, displaces 6,900 tons and can be armed with sophisticated Mark-48 torpedoes and Tomahawk cruise missiles. 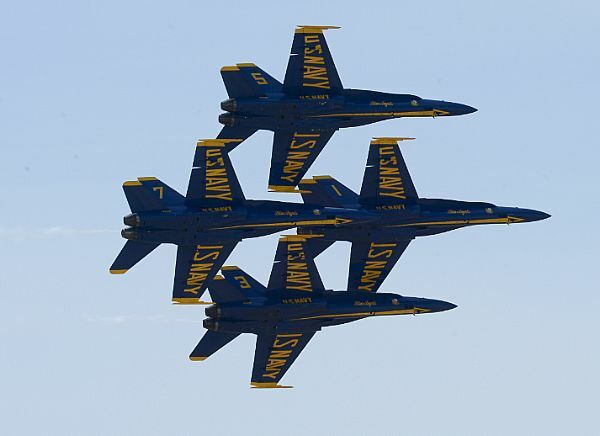 For more news from Commander, Submarine Force, U.S. Pacific Fleet, visit www.navy.mil/local/subpac/. 2 Dinners and… a Lack of OPSEC! In the last week, my family and I have gone out twice for dinner. In both of our adventures, we were seated next to tables that consisted of 2 or 3 women with 2 or 3 kids apiece. Needless to say it was a little loud and rowdy at times. I have 3 kids myself and it never ceases to amaze me how hard it is to gain control in public settings. But I will say that I always walk away from these situations feeling a little better about my children’s behavior in public settings. Ok, now to switch to the real topic. This post is not about how to gain control of your children. It is about the conversations these women were having in VERY public places! We happened to be seated within earshot of both tables, and because none of these ladies apparently ever learned how to use a six inch voice, I could now give you the complete schedule, port calls, gossip, mail drop, and probably half the crews names for 2 ships that are currently deployed. They spoke openly (and LOUDLY) about how often they get emails, where the ship was and where it was going. They spewed gossip about fellow wives and crewmembers. One lady even laughed as she told how her husband (who is in control of screening email onboard) forwards her emails that are sent to the crew. She obviously has no idea this is not a laughing matter and that her husband could be severely punished for doing this. We are sitting there trying to enjoy our dinner the second night when my husband looks at me and says, “Seriously? Again?” I am assuming he can see me getting extremely irritated by the conversation at the next table. 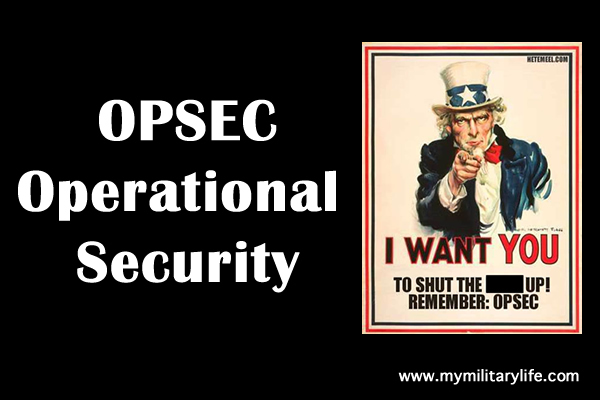 Not only do these ladies have no idea how to talk quietly, they have obviously never heard of OPSEC, do not understand it or just do not care! On a side note they also had no regard for their own personal security, I can tell you I know enough about almost every one of them to show up at their house, work, their kid’s schools and extra curricular activities. 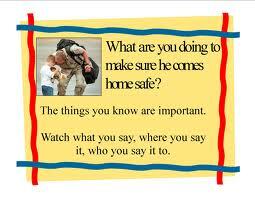 I also now know when they will and will not be home, and that their spouse is deployed. Luckily for them I have no time or desire to do so. However, someone else might. The most humorous thing is at one point they actually discussed OPSEC and how one of their fellow wives had posted something on Facebook that shouldn’t have been there. After they repeated amongst each other exactly what she had posted they discussed how dumb she was. HELLO!?!? Anyone else see the irony here? The point here is that you may think no one is listening or that no one wants the information you are speaking about, but I can promise you someone out there would love to have the information I got just from going out to dinner. Someone is always listening, whether they want to be or not. Some people are trained to hear keywords that force them to eavesdrop on a conversation. Not all of these people are terrorists; some of these people have been trained by our own military to report these things to the appropriate authorities. The most important thing to remember: even though you may feel the information you have is an entitlement it is not, it is a privilege! Be aware of the situation in which you are discussing sensitive information, because you never know who is listening.